I can’t remember where I came across this photograph. It was taken in Jerusalem and possibly from a time when the techniques of photography required staging the shot. I don’t know if the place the man is working is his regular shop or if he sets up shop wherever he happened to be. Perhaps he has more tools that are not in the photograph. 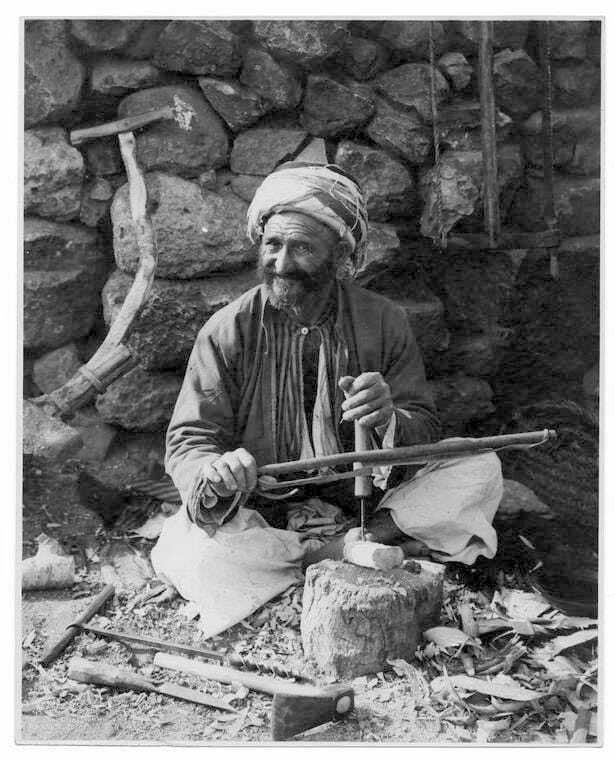 He seems to have most of the necessities close at hand; an adze, auger, chisel, bowsaw, bow drill and a small stump for a bench. I’d miss my planes too. I’d also miss the laptop streaming the BBC World Service and my coffee mug! Just goes to show you how few tools we need in order to be happy woodworkers. But I’m not about to part with my stockpile of planes! I agree with you. I am continuously impressed with the technology and abilities of people in the so called “undeveloped” world. We hear a lot about American, European, and Japanese woodworking traditions, but not much from other parts of the world. Some of that is understandable, but surely we are missing out on some interesting stuff in other regions.